In addition to being quality and experienced area rug cleaners in Las Vegas, Oriental Express offers a wide variety of other services, including upholstery cleaning. Upholstery is the padded fabric that covers big pieces of sitting furniture, like armchairs, sofas, and even the seats of dining room chairs. These pieces of fabric can get dirty just as much as any other type of fabric, and maybe even more depending on the traffic the piece of furniture experiences. Thus, regularly cleaning the upholstery is necessary to ensure that it is as clean and fresh as possible. What’s so interesting about upholstery is that it’s not often thought about in regards to cleaning. When it comes to our rugs, however, we’re more prone to investing in rug cleaning services because of the foot traffic — from both pets and humans — that comes in contact with our area rugs. But upholstery on our furniture is no different. From the various people who sit and lounge on our living room or dining room chairs and sofa, to the pets who make their way onto the furniture with or without our knowledge, to the crumbs and stains from various food and drink spills, the upholstery on our well-loved furniture may be not be as clean as it looks on the surface. Your furniture is an investment, and you want to keep it in as good of condition as you can for years to come. One of the ways to keep your upholstered furniture — like big armchairs, couches, padded dining room seats, and even those accent chairs in the bedroom — in good shape is by having it professionally cleaned at least once a year. Depending on how much traffic your pieces of furniture get, you can even consider upholstery cleaning twice a year, and especially so if you are young children and pets who play on the big couches and chairs. With most furniture, it’s hard to tell when it’s dirty and in need of a good clean. A quick and easy way to check is to take a white dampened cloth or paper towel and wipe the surface of a piece of upholstered furniture. If the cloth is slightly grimy or picks up pieces of dirt or crumbs, it’s time to call up Oriental Express for an upholstery cleaning. As area rug cleaners, we know the importance of being effective and efficient with upholstery cleaning. Being detail-oriented is essential when it comes to cleaning the pieces of furniture that we come in contact with the most. Getting the job done correctly and thoroughly the first time around is our priority when it comes to any type of cleaning we do, and this mentality translates into our upholstered furniture cleaning work. 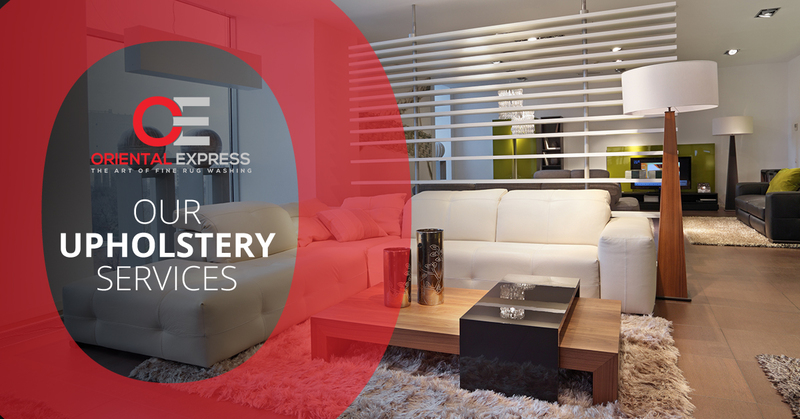 If you live in the Las Vegas area and are looking for an upholstery cleaning company, look no further than Oriental Express. Give us a call today to learn more about how our upholstery cleaning can be of benefit to you.